The Blue River flows north through Breckenridge and Silverthorne on its way to the Colorado River. The Upper Blue, also known as the Stair Steps is just north of town and holds many enormous fish in ponds created by these steps. There is very easy access along the bike path that follows the river. There is great fishing between Breckenridge and Lake Dillon. This stretch of the river is above 8,000' and the scenery is amazing. This stretch of the river is about 10 miles long and it holds many large fish averaging between 13" and 18". The most popular portion of the river is the outlet from Lake Dillon about 60 miles west of Denver. This section flows through Silverthorne and holds some large Trout, many over 24”. Since this popular river gets a lot of fishing pressure it will require a stealthy and skilled approach. Some of the largest fish in the state can be found in the first few miles just below Lake Dillon. It is not uncommon to find fish greater than 10 pounds in this stretch. The last good stretch of this river occurs as it feeds the Green Mountain Reservoir. 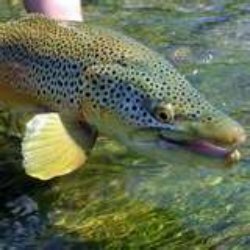 The stretch between Lake Dillon and Green Mountain Reservoir is about 20 miles and has some great fly fishing. Highway 9 follows the entire fishable waters of the river and there are many areas of great access. As you go north from Silverthorne, the river changes from public access to private access and back. Be sure to check the local fishing regulations and pay attention to posted signs so you are not trespassing. Some of the most successful flies on the river are Midges, Caddis, Stone Flies, Grasshoppers, Mayflies and a Mysis Shrimp. In April and May there can be some great fishing with Blue Winged Olives and this repeats itself in September. During the summer months the fishing can be unforgettable when the Green Drakes are present. Current stream flows and area weather. Here is a map of this great mountain stream.